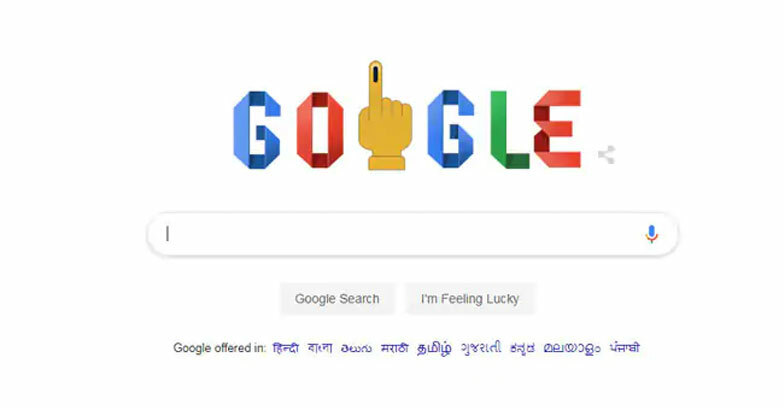 On the day of voting begins in Indian Google doodle marks the election with an index finger carrying an ink mark. The doodle also gives the instructions for how to vote in the election.Ninety-one Lok Sabha constituencies spread across 18 states and two Union Territories will go to polls today in the first-phase. The states of Andhra Pradesh, Arunachal Pradesh, Meghalaya, Uttarakhand, Mizoram, Nagaland, Sikkim, Lakshadweep, Andaman and Nicobar Islands and Telangana will vote today in a single phase. Voting will also be held in parts of Assam, Bihar, Chhattisgarh, Jammu and Kashmir, Maharashtra, Manipur, Odisha, Tripura, Uttar Pradesh and West Bengal.